Rainbow Trout is perhaps the most popular species of fish in Utah. It is present in more waters across the state than any other fish species. Rainbow Trout are heavily stocked by the Utah Division of Wildlife Resources (DWR) in coldwater lakes and streams all over the state, as well as in the state's "Community Fisheries". Rainbow Trout have been the staple of the Utah DWR's management program for many decades. Rainbows are raised in state fish hatcheries, and stocked as fingerlings, fry, and catchable sized fish in nearly all Utah waters. Rainbow Trout are a beautiful fish, fun to catch, and very good eating. They are easier to catch than many other fish, making them a good choice for kids or novice anglers to target. 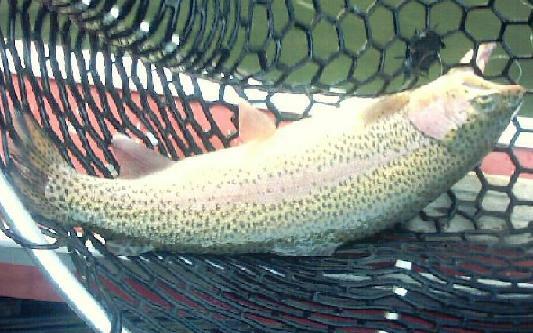 Rainbows can usually be identified by their silver sides with the iridescent pink horizontal stripe on their sides. Colors vary greatly with patterns depending on habitat, size, and maturity. Stream residents and migrant spawners are darker and have more intense colors than lake residents or nonspawners. Lake residents tend to be silvery. A mature rainbow is dark green to bluish on the back with silvery sides. The reddish horizontal band typifies the species. The belly may be white to silvery. Irregular black spots are usually present on the head, back and sides. Rainbow Trout are heavily stocked in almost every coldwater drainage in Utah. Rainbows typically will hit bait such as Berkely's Powerbait, nightcrawlers (worms), and salmon eggs. They also readily take both dry flies and nymphs. They hit well on small spinners made by companies such as Blue Fox, Mepps, Rooster Tail and Panther Martin as well. If you're looking for a good hard fighting fish, try catching one of the very large Rainbows that live in places like Strawberry Reservoir, where they can be caught with flies like Wooly Buggers, or with bait such as worms or powerbait. Rainbows tend to hang out closer to shore near the weedlines, whereas cutthroats hang out in deeper water throughout the summer. It is difficult to target them from shore during the summer, so a small boat or float tube can be very useful. Whether you fish a local community pond, a high mountain lake, or a large reservoir, Rainbows are fun to catch, and good to eat! Many waters have specific restrictions. Make sure to read the fishing proclamation before you go to make sure that you will not violate wildlife laws.